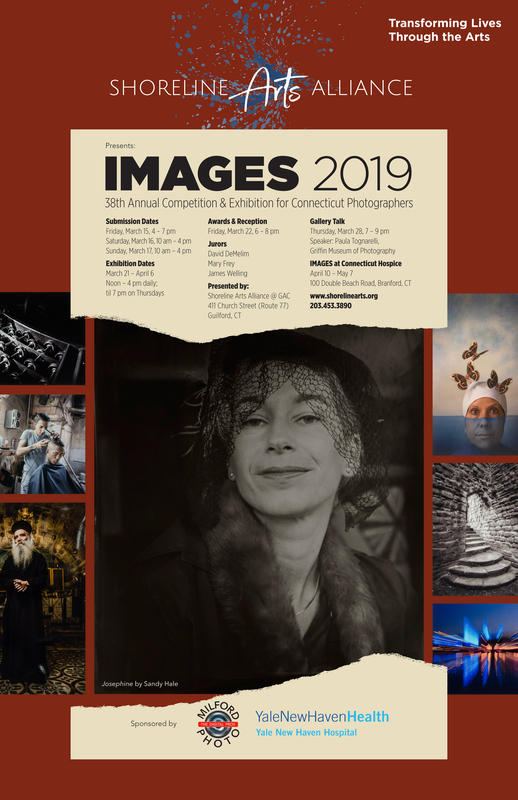 Shoreline Arts Alliance presents Connecticut’s oldest photography competition, IMAGES 2019. IMAGES is a state-wide photography competition open to Connecticut resident. The competition is juried by a group of out of state judges who pick works to hang in the month long exhibition in Guilford, CT. Awards are given to certain pieces chosen by the judges. Submissions are in person on Friday, March 15 from 4 pm – 8pm, Saturday, March 16 from 10 am – 4 pm, and Sunday, March 17 from 10 am – 4 pm. Online application should be submitted before drop off can be made in person. Please visit www.shorelinearts.org/images for more information on submission guidelines, cost, dates, and the application. All photographs entered in the competition are the sole ownership of the artist until purchased by a viewer at the exhibition. Shoreline Arts Alliance does not claim ownership to any of the submitted works. Shoreline Arts Alliance reserves the right to use photographs of work and digital copies of work, provided by artist, for the purpose of marketing and promoting Shoreline Arts Alliance as an organization and IMAGES as a program. Proper labeling and credit will be given to the artists when an image Is used. No other persons outside of Shoreline Arts Alliance has a right to use these works for promotional purposes unless it is in direct relation to the IMAGES exhibition.